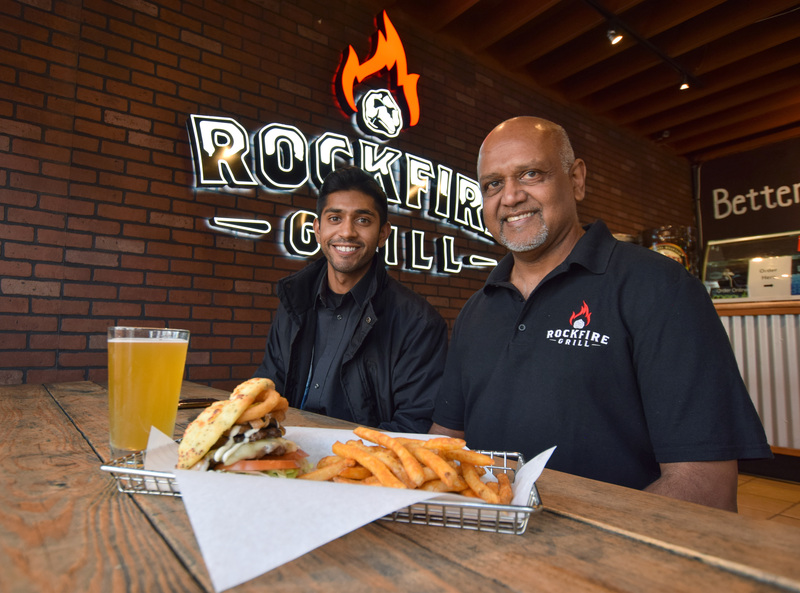 Photo: Julia Keane Rockfire Grill is the brainchild of Jai Syal (left) and Raj Syal. The menu features a variety of flatbread burgers, pizzas, and wings, but even after only being open since December 2018, there are already some clear fan favorites. Best sellers include the OMG Burger, topped with lettuce, tomato, Pepper Jack cheese, house spread, grilled onions, onion rings, mushrooms, roasted garlic cloves, garlic aioli, and jalapeños; and the Chipotle Burger, topped with lettuce, tomatoes, Pepper Jack cheese, house spread, fire-roasted peppers, guacamole, and chipotle ranch. Their wing section is expanding, and Syal said that the seasoned fries are so delicious that they enjoy a “cult following.” With pizza on the menu, there’s a little something for everyone ​— ​even our vegetarian friends. “People don’t just come for the food; they come for the experience,” said Syal. Being a four-minute walk from the infamously raucous scene of Del Playa Drive, Rockfire must keep the party alive inside the restaurant. The loud music, craft beer specials, and flat-screen TVs work well in bringing the vibe from the streets to the restaurant, but Rockfire also hosts events like Wednesday-night karaoke. Rockfire customers are greeted with today’s hits blaring over the sound system, accompanied by a friendly staff to match the energy. The inside seating has long, cafeteria-style tables, giving it the feel of an adult lunchroom, but instead of juice boxes and milk, it’s beers and seltzer. This is the perfect setup for pack-animal college students who can never find enough group seating in classic restaurants. Rockfire also offers outdoor bench-style seating, perfect for snacking while soaking up the Santa Barbara sun. But no matter your age, Rockfire Grill offers a fun twist on an American classic. And if you want to skip the party vibe but want to taste a bun-less burger, keep a lookout for their Grubhub debut in the next few months. Rockfire Grill’s speciality: The OMG Flatbread Burger with onions, mushrooms, and garlic. Rockfire Grill in Isla Vista features a spacious patio. Jai (left) and Raj Syal (right). Rockfire Grill features local craft beer and a variety of classics.